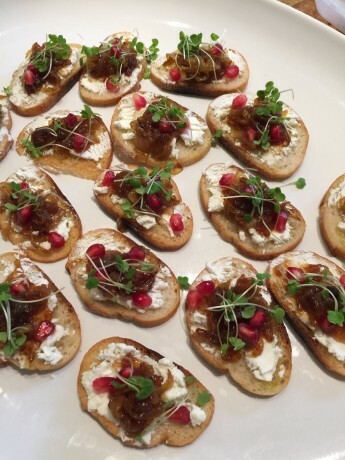 The sweet-tart red pomegranate seeds and arugula microgreens with goat cheese and caramelized onions give this appetizer a festive, holiday hue. Prep can be done ahead of time. Make the caramelized onions. In a large, heavy skillet, add sliced onions and 2 tablespoons of olive oil. Start on a medium high heat, when the onions start to stick, turn flame to medium or lower. Saute for about 30 minutes, stirring the onions often, and scraping up any brown bits sticking to the bottom of the pan. If needed, add another tablespoon of olive oil and 2 or 3 pinches of salt to flavor and draw out the moisture. The onions are caramelized when they are golden brown, soft (no crunch left) and sweet tasting. They will cook down to about 1 cup. Make the crostini while onions cook. Preheat the oven to 350 degrees. Thinly slice the baguette. Place as many slices on a baking sheet as fit. Brush each with the remainder of the olive oil and a light sprinkling of salt. Bake until lightly crisped, 10-12 minutes. Repeat with another round, if needed. To assemble. Add a smear of goat cheese (about 1 teaspoon) to a crostini, top with a teaspoon or so of the caramelized onions, and about 1/4 teaspoon of fig spread. Garnish with 4 to 5 pomegranate seeds and some microgreens. I’ve tried many different methods suggested for opening a pomegranate over the years, but the best one came from Abe, an employee at my local Whole Foods Market who originally hails from Egypt. With a paring knife, cut a circle the size of a quarter around the top and bottom ends of the pomegranate and remove each circle. Use the knife to score the fruit on the outside in 4 even quarters, just cutting through the thin red peel, not through to the seeds. Open the fruit into quarters, and nudge the seeds out with your fingers over a bowl. Discard any white pith. Pomegranate season seems to stretch longer and longer each year, but it’s primarily a fall-early winter fruit.